is stunning, with gilded tin ceilings and a lush garden wall, and the cocktail execution is fingertip-kissing good. And like with the school-days Polly of your past, there are plenty of times you’ll feel ignored, but just when you’re about to smack-talk her, she gives you an extra sample of beef jerky. ORDER THIS: Bartender–co-owner Bruno Dias’s cocktails highlight unusual ingredients, like green bell peppers, BBQ bitters and yogurt, that are sure to satiate curious palates. The Golden Eye ($13) is a standout: Stumptown cold brew is stirred with Icelandic vodka, herbal Italian amaro and chocolate bitters to create a rich, velvety, caffeine-blasted drink. 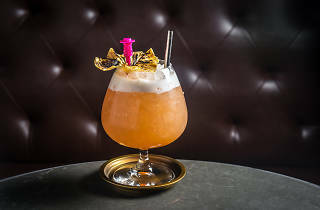 The bar’s head turner, however, is the rosy Rocket Lunar ($13), which is set in a snifter topped with egg-white foam and a grilled dehydrated pineapple. Inside the cup, BBQ bitters curb the sweetness of the drink’s kalamansi syrup and aged cachaça, along with an added touch of cinnamon from tiki bitters. GOOD FOR: A grown-up date for that prospective S.O. who’s slightly out of your league. Everything is on point for romance: The ambience is sumptuous, the cocktails are unconventional, and the circular, candlelit tables are tailor-made for two. Plus, the room hits that sweet spot of upscale and lively: The cream-and-navy space bustles with well-dressed daters and small groups engaged in animated conversations over nondescript poppy tunes. The only thing that knocks it down a notch is the service. During peak hours on a recent night, it took flagging down the waiter multiple times to put in an order. THE CLINCHER: Although not overtly European, the emphasis on intimate conviviality, well-made drinks and waiters in fitted vests exudes a Parisian charm. Framed replicas of The Garden of Earthly Delights by Hieronymus Bosch and Lady of Castile by José Puyet adorn the walls, and European cheese plates (Burgundy cow’s cheese with honey crème, Gruyère with beets and walnuts) are available. She may be young, but Sweet Polly is an Old World dame at heart. 71 Sixth Ave, Brooklyn (718-484-9600, sweet pollynyc.com). Average cocktails: $13.